Bathroom on the Small Side? Here’s How to Make the Most of It! 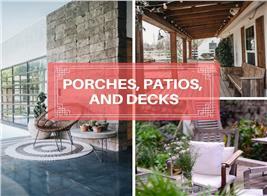 These days, tiny home plans – those usually less than 500 to 800 square feet but definitely less than 1,000 square feet in size – are all the rage, especially among younger families and Millennials. With a tiny house comes – in all likelihood – a tiny bathroom in the floor plan. That can be a challenge to a family – or even a couple. 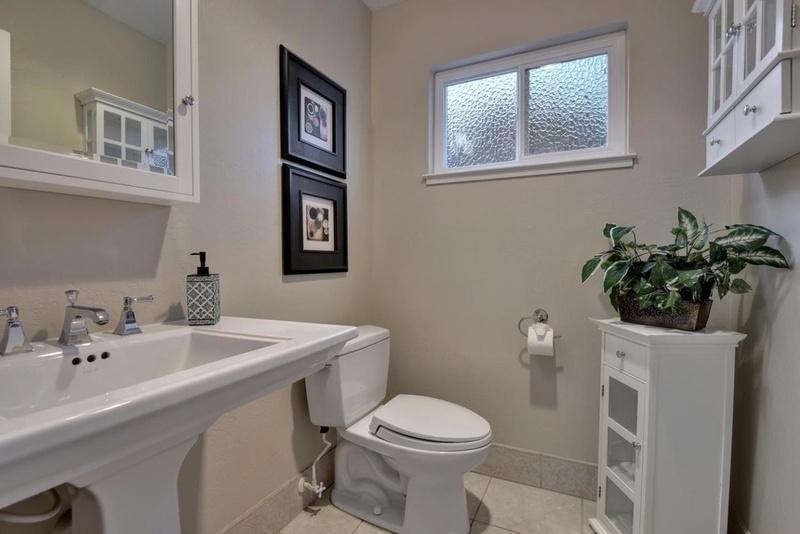 And then – in larger homes – there's the small extra bathroom that the kids fight over and leave a cluttered mess or the tiny powder room near the laundry room on the main level. 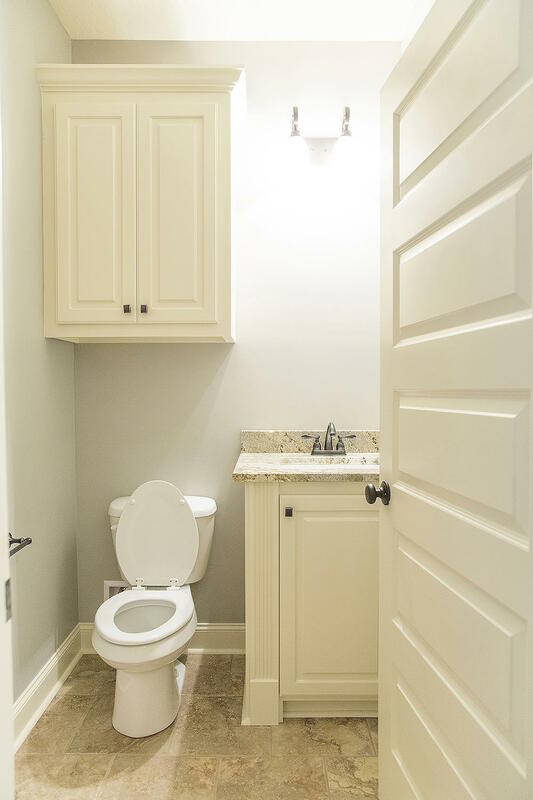 What do you do with a lack of space in a bathroom yet still make it functional? Depending on the configuration of the floor plan, you'll probably have to forego a bathtub in favor of a shower only. You won’t have the floor space for a large vanity with lots of storage. And you may have to forget about a dedicated linen closet – not to mention a lot of spa-like amenities. But all is not lost! 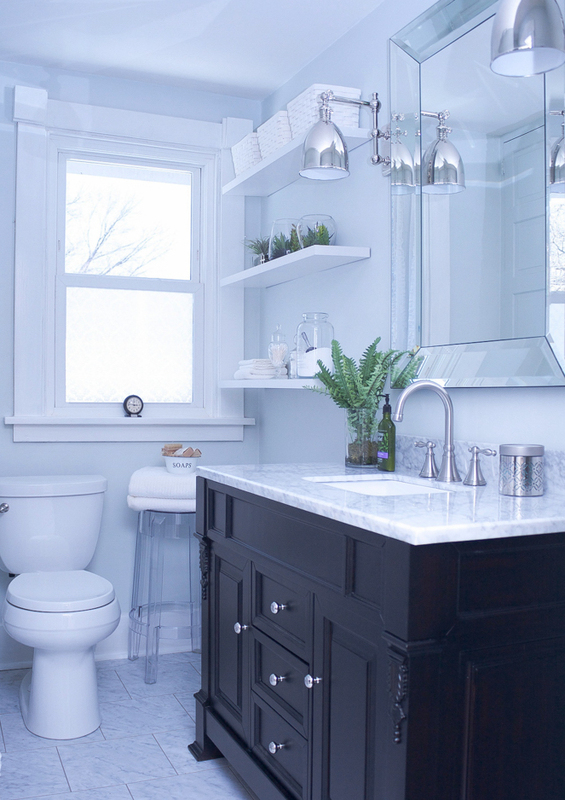 Short of remodeling – or building a larger home plan – there are some practical steps you can take to create the feeling of a larger space in your itty bitty bathroom. 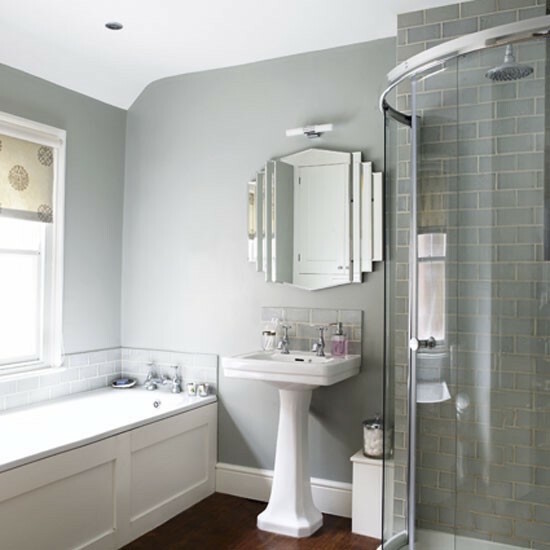 Follow our great space-enhancing tips for small bathrooms – going beyond the hackneyed (but still effective!) “install a large mirror” – and you’ll love your tiny room in no time. The tints at the top of a paint color card are lighter in value. Use these lighter tints for larger areas – like walls – in a tight space to get a maximum big room feel. 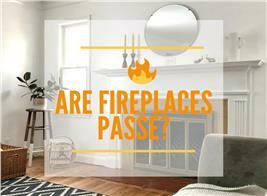 Use lighter fixtures, too, to maximize the enhancement of the perceived space. Light colors – like those in this powder room (or half bath) in a beautiful French Country style home plan – will help the space feel more open and airy (House Plan #142-1152). Color is one of the most powerful tools you have. Cool colors – like blue, purple, and green – tend to recede visually. They make a space feel open and calming. And remember that light bounces off brighter objects more readily than darker objects, so choose light tints of the cool colors. 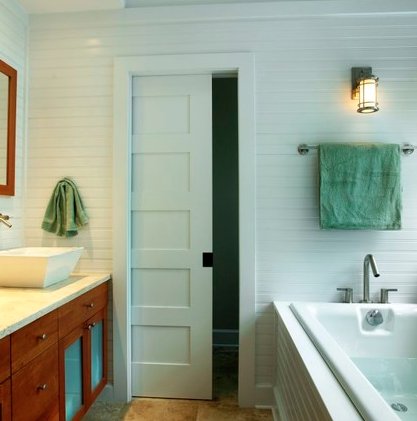 Light-tined cool walls can make the space in a very small bathroom seem bigger. A monochromatic palette uses varying tints, tones, and shades from the same paint card and is very soothing. Sticking to lighter and darker variations of the same color allows the eye to flow around the room without stopping. If you’re going to paint the walls, choose a color from a piece of tile to be used. It helps ensure that things coordinate and flow smoothly. The gray walls and tiles help keep the eye flowing in this small room. Using larger tiles means that you need fewer grout lines. With fewer grout lines, you see more solid space and not as many breaks. Your mind doesn’t perceive the separate segments of tile on the wall and reads that the space appears larger than it is. 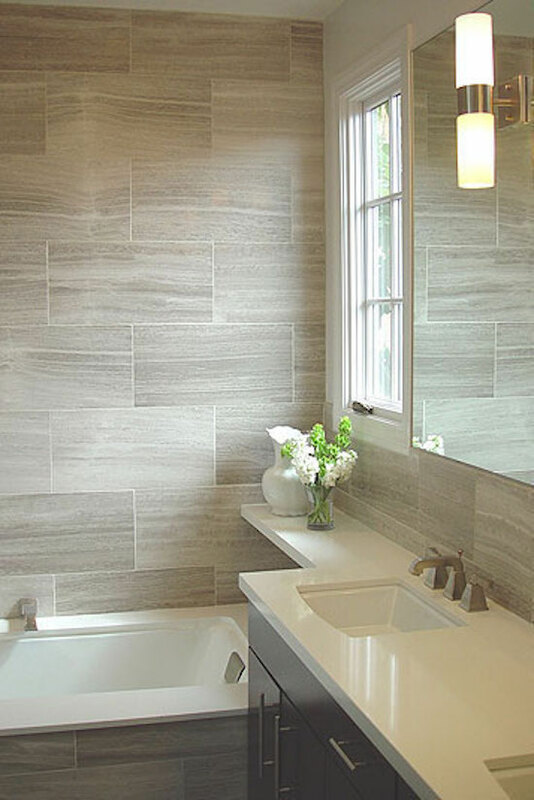 Larger tiles mean fewer grout lines, which makes the wall appear larger. Paint the ceiling a shade or two lighter than the walls to create a major impact by making the walls seem as if they keep going. A white ceiling emphasizes a stopping point. While you’re at it, consider painting the base and crown molding a few shades darker than the walls. Painting the ceiling a color similar to that on the walls gives them the appearance of more height. Windows are ideal for creating more space. Keep natural light flowing as much as possible. Curtains take up visual space and add extra layers, so skip them for maximum benefit. If the view is less than ideal or you need privacy, have the windows frosted. 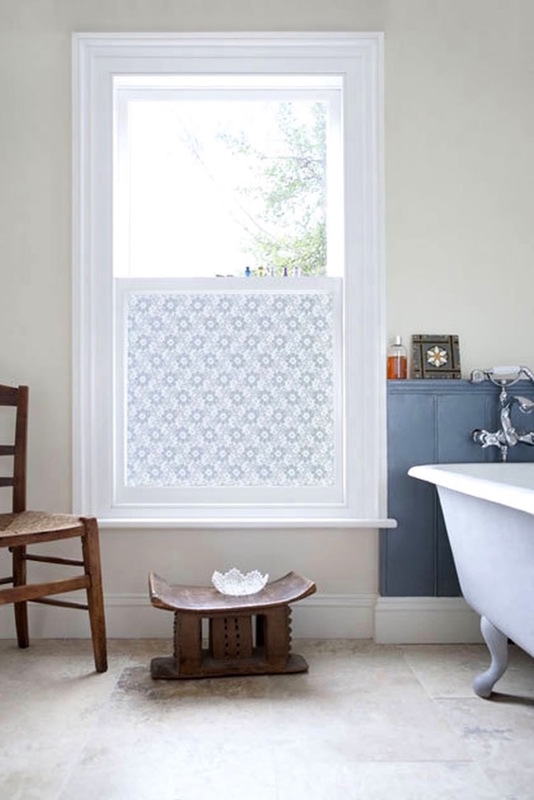 A frosted window provides privacy while letting sunlight through. 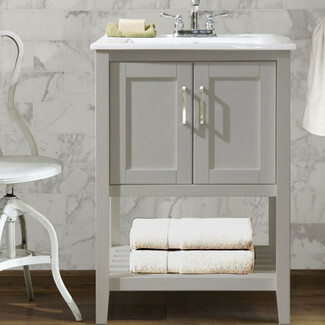 Trick the eye into seeing more space by choosing a console vanity. 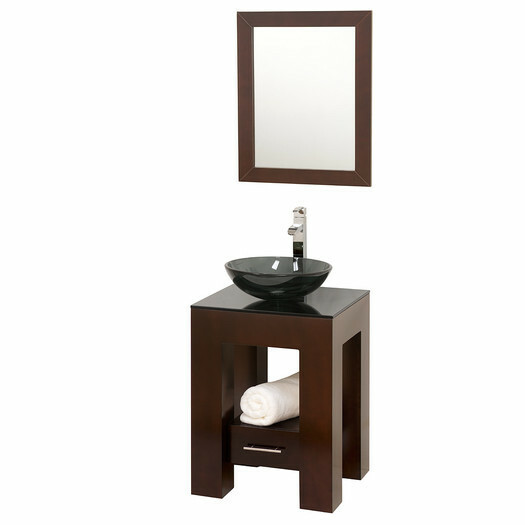 The exposed legs on this kind of vanity will keep your eye traveling farther. 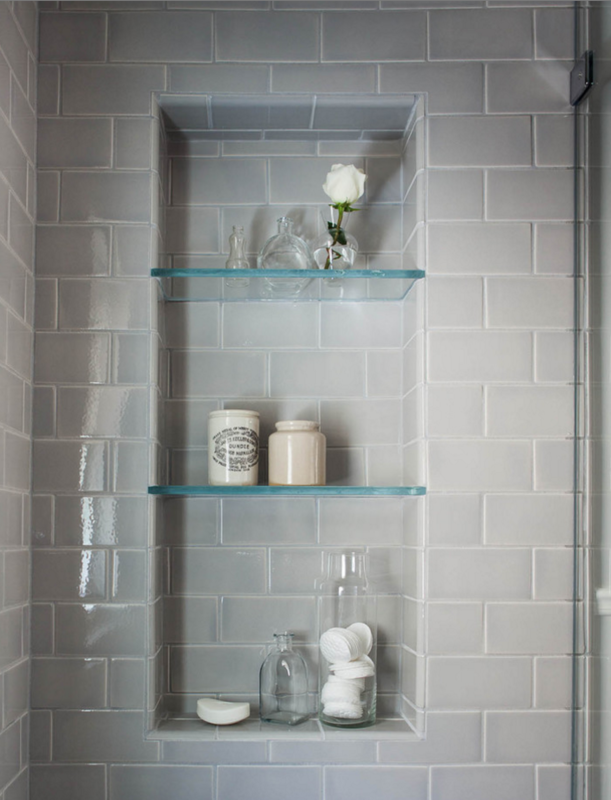 You can maximize your effort and display towels and glass apothecary jars on the open shelves. 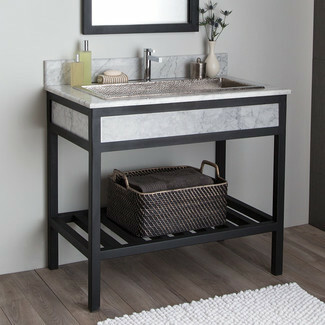 Vanities with legs create the look of more floor space. Smaller scale furniture is important. 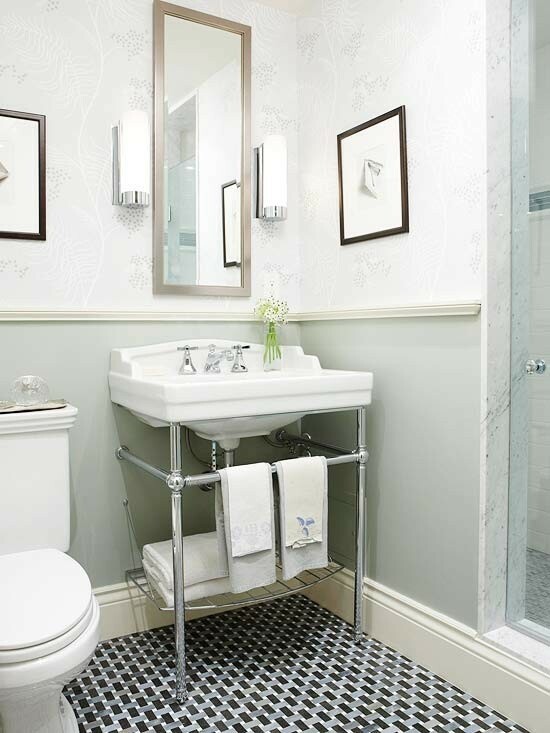 When shopping for pieces, know how much space you have in the bath’s floor plan. You may dream of having a double-sink vanity, but you might be happier with one sink if that means you’ll have more floor space. Smaller furniture is a better fit in a tiny bath. 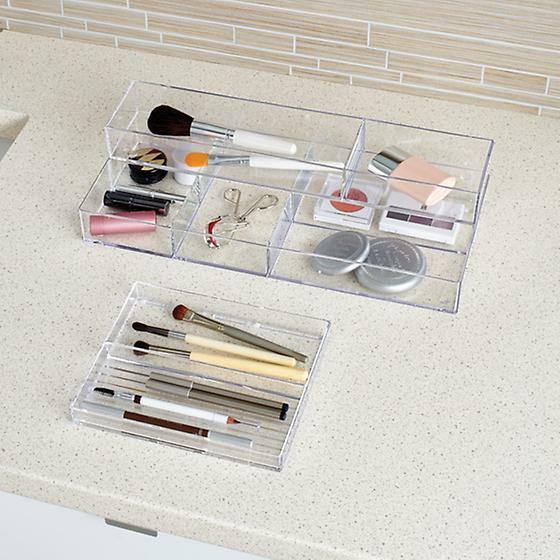 Small items like makeup brushes, nail polish bottles, nail clippers, and the like can easily overwhelm a space. Stick organizer cubes in drawers to keep things in their place and laid out. Toss anything you haven’t used in two years. Use the back of the cabinet door to hang gadgets. You’ll be amazed at the space you have if it is organized. 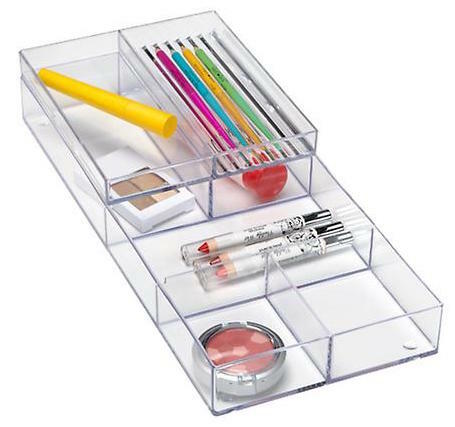 Simple drawer organizers help corral clutter. A small bathroom has to work twice as hard. Stick with multitasking hardware. 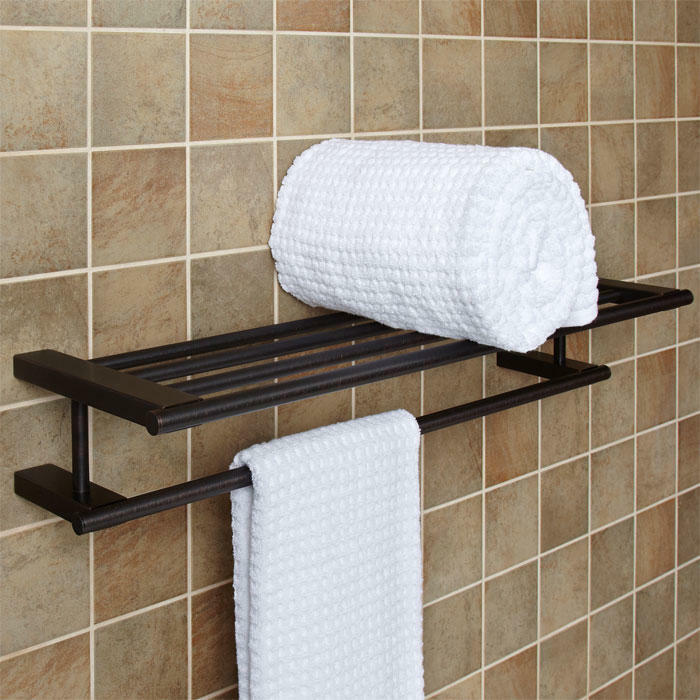 A double towel bar gives you twice the towel capacity in half the space. 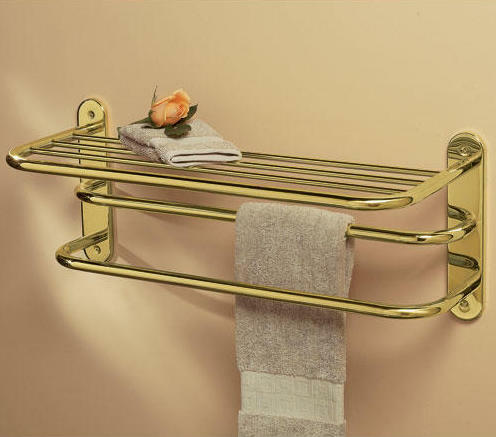 There are also towel bars with shelves. This is a perfect place to store clean towels and washcloths. 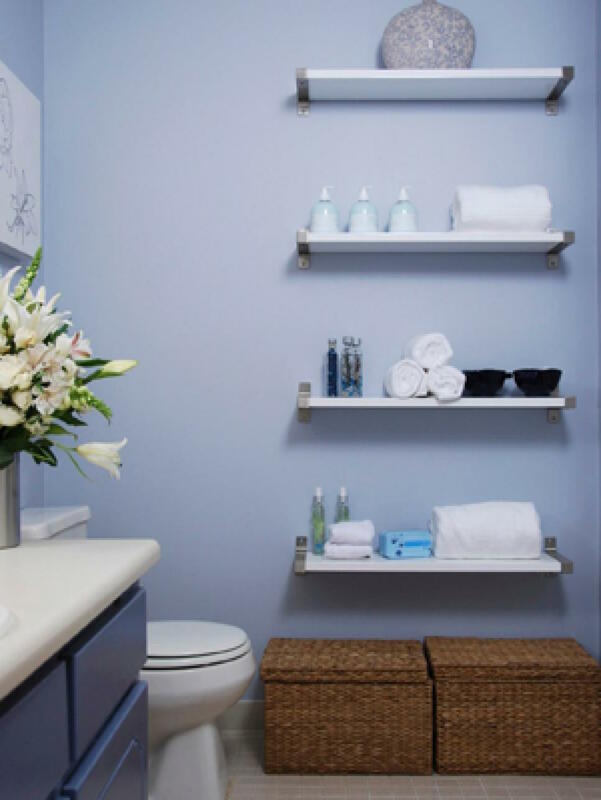 A shelf above the towel bar creates needed storage. Let the light flow – and make the room seem bigger – by using glass doors for the shower. Plus, it shows off the beautiful shower tile. 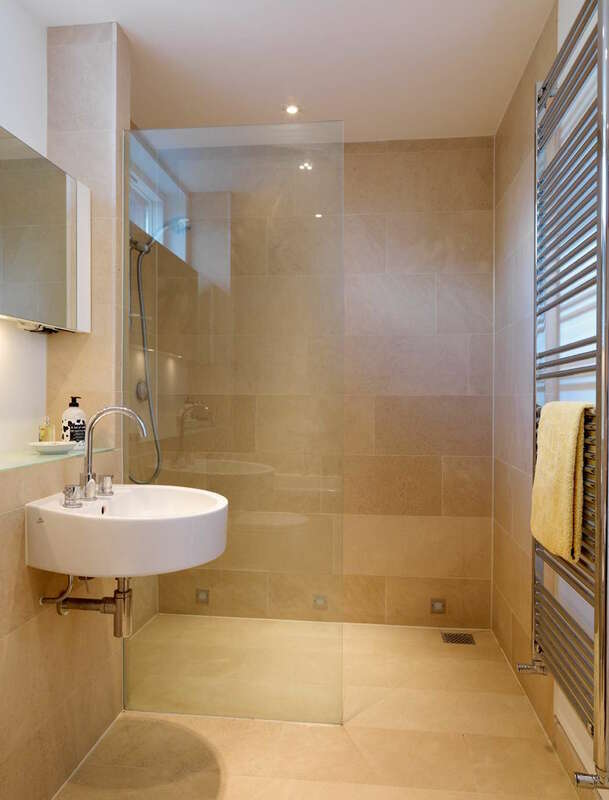 Glass doors or partitions in the shower create the illusion of more space. Tap into the hidden spaces in the walls. Add nooks in the shower to keep toiletries off the floor or the edge of the tub. Near the sink is another perfect spot to stash toothbrushes. Tuck a cubbyhole beeside the mirror, or go with some old-fashioned charm and use a medicine cabinet. Creating a niche in the shower – and elsewhere – prevents intrusion on the room’s space and provides more "elbow room" than conventional wall shelves. For the ultimate airiness, go with a pedestal sink. They take up the least amount of floor space. But consider where all the toiletries will go. Pair it with a small cabinet – a glass-front one or an open-shelf storage unit can be nice if you're neat. 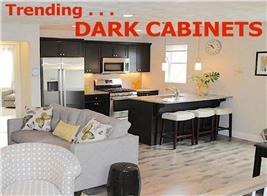 Though this arrangement may not save much floor area, the sparse pedestal sinks still make the room “feel” bigger. For really tight floor space, you can use shelving on the wall – behind or beside the sink – instead. You can also choose a console sink, which provides for some storage but, because it's see-though, doesn't close in the room. 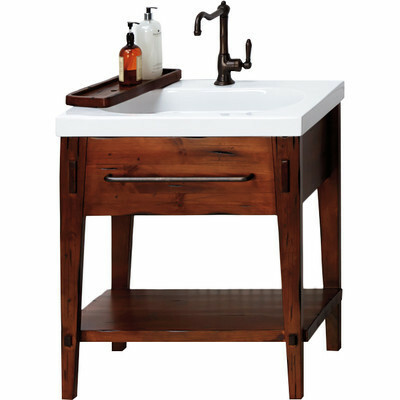 A pedestal sink with a cabinet (left) creates a more open feeling without sacrificing much storage. A console sink (right) is airy but practical. To save space, replace a typical swing door with a pocket door. Swing doors take up valuable room space and create traffic-flow problems in the floor plan. A streamlined pocket door, which takes up no floor area, solves this issue and preserves usable square footage. Pocket doors don’t subtract from usable floor and wall space in the room. Add floating shelves on walls to provide some much needed storage. The absence of brackets or other visible support makes the wall space seem more open and airy. Tuck larger items you want to store into decorative storage baskets below the shelves to keep things neat and attractive looking. Floating shelves add practical space without cluttering up the walls with brackets and the like – for a clean look. Finding extra space in a tiny bathroom is essential to one’s sanity. With a little creative thinking, you too can find bliss in your small room. Just remember to add some personal touches as well. 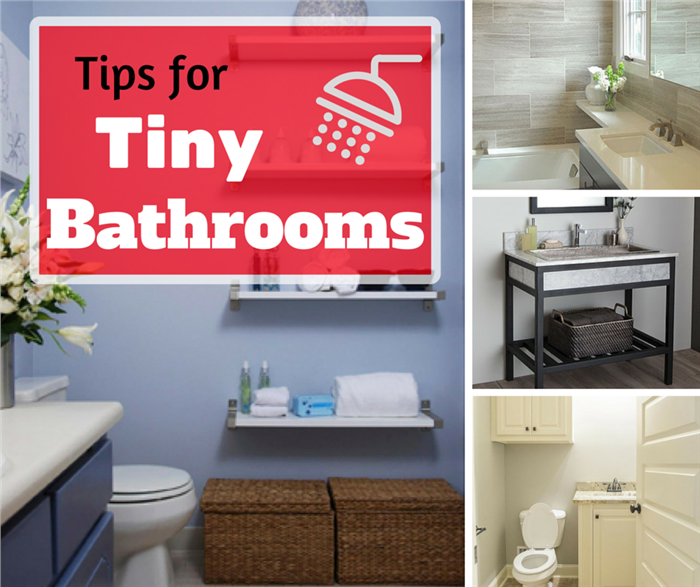 Let us know about your tiny bathroom in the comments below!